This recipe is the sponge and dough method and the sponge portion took me more than 5 hours of proofing. But the bread turned out very very soft. Hubby wants to have it for breakfast with his coffee. Jonathan just had two pieces and he wants to bring some to school tomorrow. Note: I did not add raisins and almond flakes as my children doesn't like them. Since I omitted that these two ingredients, I have increased the amount of brown sugar and also added about 100g of soften butter into the sugar and cinnanmon mixture and mix them into a paste to be spread over the dough. 1. Prepare the sponge by mixing the 3 ingredients on low speed for 3 minutes. The sponge should be firm, dry and cool to the touch. Leave the sponge to rise for 4-5 hours in an airtight container. 2. When the sponge has risen, prepare the dough. Place the dry ingredients into the mixer. Add cold eggs and begin to mix on low speed. Immediately cut the sponge into a few pieces and add to the mixture over 1 minute. Increase speed to medium and mix for 2 minutes. Add butter and mix for another 7-10 minutes. Round up the dough and rest on a flour-dusted table for 15 minutes. 3. Roll out dough into a 1-cm thick sheet, measuring 30cm by 50cm (I did not measure). Brush melted butter over the dough and sprinkle with raisins and almond flakes. Premix the brown sugar and cinnamon powder and sprinkle evenly over the raisin and almond flakes. 4. Roll the dough down lengthwise like a swiss roll and apply water on the seam. Brush melted butter all over the dough. Cut into 12 pieces and place into a well greased baking tin. Prove dough for 1 hour in a warm place till the dough doubles in size. Brush the surface of the rolls with beaten egg and sprinkle with almond flakes. Bake in a preheated oven at 190C for 25-30 minutes until golden brown. Hi Baking Mum, understand that you have a KA mixer too. May I enquire what speed do you use when u knead the bread dough please. Thanks in advance and indeed the bread look real soft. Recipe please!!! Looks so so so delicious! Yum, it looks too tempting! Wow! This is lovely! I love your pastry! Ok, let me get the recipe typed and posted here. When I use my KA for bread dough, I started with low speed and after adding everything that I need to add I slowly switch the speed to medium like 5 or 6. But if the speed is higher please make sure you stand by the machine in case it shifts while the machine is kneading at a higher speed. Hi lh, I know usually pple use low speed when it comes to kneading dough but for me I change to medium when everything is added to the dough so that I can get a more well kneaded dough at the end of it. Enjoy browsing thru you site, very enlightening. Cud you let me know what brand of bread flour you use for your bread, they all look so white and fluffy. Can't get that nice white texture on my bread. Tks. Hi Dolly, I usually get my bread flour from Phoon Huat. Or else I will use Prima's bread flour. hi bakingmum, could i get the recipe as well? thanks. 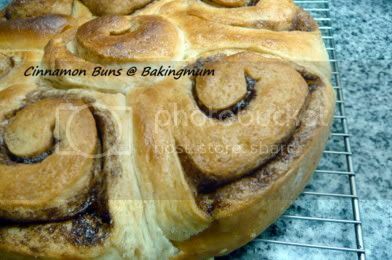 Dear BakingMum, do u mind sharing the recipes as the Cinnamon roll I made always turn hard the next day, don't know why? 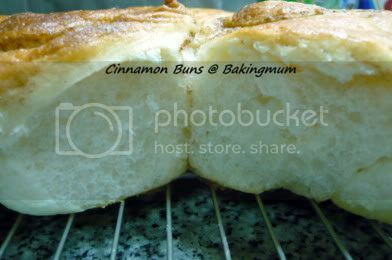 Please also advise if i keep my bread/bun in the fridge and rebake, will it become very dry? Thanks. i feel so hungry now!! How to get the recipe?. They look really good. Have you tried making them with real Cinnamon. The Cinnamon that we buy in the US is actually Cassia and not Cinnamon. Real Cinnamon is much sweeter and you can reduce on the sugar. hey, how do you proof the dough? The cinnamon we can get here is usually the powder form or the stick form. Just leave the dough in the bowl and cover it with a clingwrap of damp cloth to let it proof. I leave the dough in a plate coverered with a linen and higher temperature. And free of fresh air. Sometimes i open the dooor of the oven and let the warm air to flow near the buns.